I can vividly recall the Minnesota State Fair foods from my childhood. The wonderful scent could be detected from miles away. Sweet Martha’s Cookies (with a side of ice cold milk), chili cheese fries, corn dogs, and everything imaginable from spaghetti to candy bars, was available skewered, battered, and deep-fried. Fair food “on-a-stick” was certainly a treat. While these foods lacked nutrition, they certainly packed in flavor. Eating clean isn’t something that happens easily at the fairgrounds. I now long for healthier options, but this doesn’t mean that I don’t enjoy the fun of foods on a stick. Athletes need fun, feel-good foods to lift their spirits after a hard training session, and food on a stick is just the ticket. Shish kabobs (a.k.a. stir fry on a stick) are a simple summery delight that can pack a lot of flavor and nutrition into a complete meal on a stick. Skip the battering and deep frying and give these skewered steak bites a flavorful marinade followed by an easy-handed toasting on the grill. You can also broil these for a similar flavor impact. My favorite vegetables for grilling are peppers and onions. Bell peppers have a high amount of antioxidants as well as fiber. Onions have been used by athletes for decades to increase immunity and provide quercetin, an important antioxidant. Before athletic competition, Greek athletes would consume onions in large quantities and some would even rub onions on their bodies with the goal of purifying their blood. Onions have been found to lower blood sugar and help maintain proper blood chemistry and cholesterol balance to keep your body running smoothly. However, I wouldn’t recommend accomplishing this by rubbing them all over your body unless you want your fellow athletes to stay far, far away from you. Other easily skewered vegetables are broccoli, zucchini, and grape tomatoes. Serve with rice to add carbs to your meal. For dessert, keep with the summer fare and skewer a pineapple and peach chunks. Give them a light honey balsamic glaze and let them caramelize on the grill for a delectable dessert. Other vegetables as desired: broccoli, grape tomatoes, zucchini, etc. In a bowl, combine tamari, vinegar, ginger, garlic, honey, Sriracha, and sesame oil. Add cubed steak to tamari mixture to coat evenly. Marinate in refrigerator at least 1 hour and up to 24 hours. When ready to prepare, heat grill to medium heat. 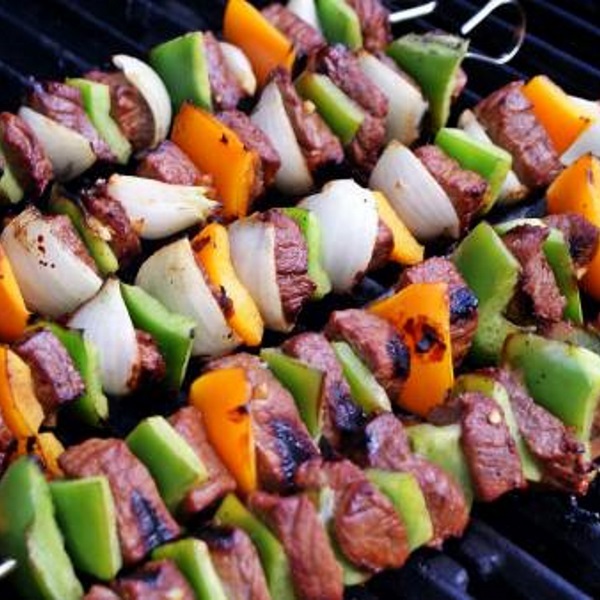 Alternate placing meat and veggies onto skewers until all pieces are skewered. Grill for about 5 minutes on each side until meat is cooked to desired doneness. Vegetables should be tender crisp. For dessert fruit skewers, combine honey, balsamic vinegar and salt in a small saucepan and heat until combined. Skewer the peaches and pineapple and baste with honey mixture. Grill over medium heat turning and basting occasionally until fruit is warmed and is slightly caramelized, about 10 minutes. Serve with remaining honey glaze as a dipping sauce if desired. Note: if you’re using wooden skewers, be sure to soak them in water for 30 minutes prior to grilling or broiling to prevent them from catching fire.